Productivity requires Action. When you are exposed to a new strategy or learn a new skill the best thing you can do is find a way to use it right away. Even if it is just one small step, immediate action sets you up for greater productivity. For example, you may learn a new way to build your online visibility with article marketing, but you will not be productive until you take action on it. Immediate action toward your goals multiplies your chances for success. Done as a habit, it virtually guarantees your success. So what one step will you take before your head hits the pillow tonight? However, my 5% disagreement is when I’ve had times when I thought something was a fantastic idea and I didn’t take action on it and I kept thinking “I gotta do that” OR some other thing got in the way (maybe a vendor who didn’t come through) and then for some reason or another, it turned out it was a good thing I didn’t get around to it! I think this is why it’s SO important to 1) be truly connected to yourself so you can “hear” what your intuition is trying to tell you and 2) surround yourself with people who are FURTHER ALONG than you are in your business. So you can get their experience and perspective on moving forward and know if it’s truly what you want to do. In theory it sounds good, but when you think about it — had you taken action immediately on your idea you would have found out “sooner rather than later” that it wasn’t going to pan out. Now, ask yourself — how many times did this idea creep into your head because you hadn’t done it? Therefore, it was an unresolved issue that just kept getting in the way of more creative thoughts. I have this ritual that I follow everyday. I purge my thoughts first thing in the morning, before I do anything else. Especially before I sit down to write. It allows me to clear my head of all the irritations there allowing my creative muse to be that much stronger. Now, if I didn’t do this every day – I’d never get anything done! Have a good day you two! True… all super successful people have a LOT more failures than they do successes… REmind me to tell you about some of my doozies. OK, you two. Both have great points and MY point is that nothing is ever ‘cast in concrete’…there are no absolutes. While I’ve often acted quickly and been thankful I did, sometimes my intuition says to wait. There may be more I need to know that can make me even more effective. OR there may be a better action. Thanks Barbara – you rock too! So, what about the Baby Boomer workaholic like myself who is loaded with “next things to do” and have trouble prioritizing? Perhaps I am the exception but I want to find the “zone” where I get the most important things done, things with the most value toward my goal and let the others go. Ways To Kill Your Greatest Aspirations” coming soon. LOL! Otherwise known as analysis paralysis right? I can relate very well to Maritza. As a 50 year entrepreneur who still burns the midnight oil in search of new ideas staying focused is a significant issue. Working “on the business” not in the business is the mantra for this top gun. Ideas need to have a context. I believe that action without meaningful deliberation (not delayed) can be harmful both in the long and short run. I think you can both be “right” depending on what perspective you are coming from. Action is Key to all things productive. I am with you there 100%, however; it is important to make sure that the action you are taking is in line with your overall business priorities. Action alone will not necessarily lead to good things. I see it all of the time — people busy being busy. But the various actions are not leading them to an ultimate goal/vision. You can take action and do a number of things and still not get anything substantial done. As a small business productivity coach, I work with coaches, consultants, service professionals and small businesses owners every day and find that strategic, focused decision making then action is even more key. For some, that is a normal thinking pattern and for others it takes a bit more work. Before you start any project, you should evaluate it against the priorities you have set. Does this action fit with the direction you are headed? Really? This is the step that is frequently skipped over. We rush into a BSO or think we should. Maritza, maybe that action that you ultimately decided was better off not done was a BSO? Once you determine that an activity is a priority and not a BSO — jump on it! Don’t let that home-study training become “shelf ware.” Do something with it right away. If you attend a live event, make sure to allocate time to implement what you learned! You holding the knowledge is never as strong as you doing something with that knowledge. LOL! I’ll have to add the “there must be a reason it starts with BS” to my talks on BSOs! That is fantastic. I agree that self-knowledge is important. Many people that I work with are still working in that direction. Productivity is about a lot more than having the “right” bins and boxes or the “right” system. It starts inside first. The art of it is identifying the strategies, techniques, and tactics that work for the type of person you are. There are some that never start anything because they are continually collecting information and there are others that are in a consistent state of starting. For example, I have some clients that struggle with Attention Deficit Disorder. For many, the challenge is not taking action, but FINISHING action. When the attention darts from one project to another, frequently action is started; but not completed before the next idea comes along. In this example, all of the actions may be the exact right thing (not BSOs), but focus and completion may need a bit more work. BTW – you two really are awesome. Thanks Stephanie! I love it! Sounds like you are gifted at helping people de-clutter in many ways… isn’t physical clutter just a reflection of the same inside? And we think you’re awesome too! Thanks Stephanie – I really like your term BSO. Actually, both of you are correct. However, I’d like to add to the discussion: It’s important when you receive inner guidance to take action on it *in that moment. * For example, one time when I was hiking I got an intuitive hunch to call an acquaintance whose number I did not have on my cell phone contact list. However, I remembered I called him a couple weeks before and his was the only number in a particular area code, so I could find it in my call history easily. It turns out I had called his place of work (I had previously called both his home and work number). And I won a pair of tickets to the Monterey Jazz Festival!! I mean if I had waited even a few seconds I would have missed the opportunity. When it comes to inner guidance and connecting and integrating with your higher self, there are windows of opportunity available that are not available if you wait too long to act. Or else google “Being in The Moment – What Does It Really Mean?” if links are not allowed in this post. Christine, that is such a great story! Your intuition won and you won! Tinker, to get into the “zone” (into the flow of the Interconnectedness) be aware of what’s important for you to do but be flexible and follow your inner guidance as to what is the most important thing to do IN THAT MOMENT. This DOUBLES (and more) your power. Keep reminding me that all the knowledge in the world is useless if you don’t apply it… and the sooner the better. You two make a great team and I would recommend that people choose you as their teachers if they are wanting to learn article marketing (or online marketing). Thanks for not giving us the “hope” without telling us the “how to”. I would put myself in the category of a newbie. Just came back from UIBC-Orlando in December. I’m inclined to agree with Jeff though sometimes I have responded more like Maritza. One of the things I learned from Jeff at UIBC was submission of articles. I really see the value in contunuously writng articles for marketing my site. However, I didn’t take action writing articles right away, not because I intentionally put in on the back burner, but there is so much “stuff” to learn about the business. One tends to get feet of clay because a newbie just isn’t sure which road to take. For me, I’ve been focusing on the development of the content on my site itself. The marketing I did was learning facebook and twitter. 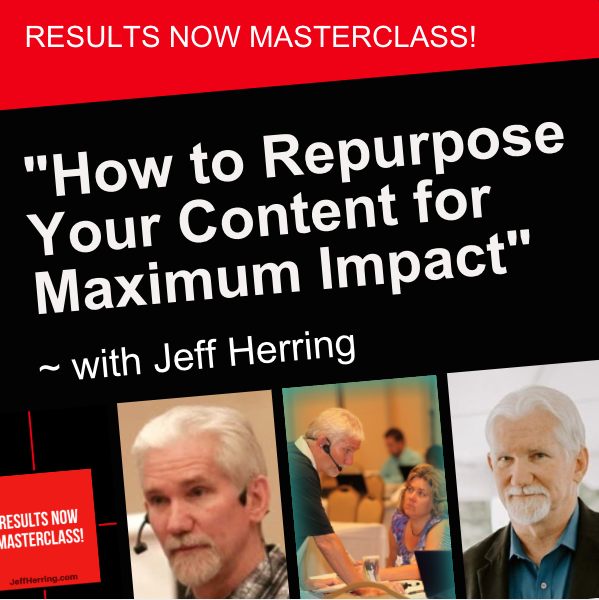 I ran into Jeff on facebook the other day thankfully found the repurposing webinar. I finally submitted my first article to ezinearticles yesterday. Waiting for approval. 2 plus months after UIBC, I have decent website content(I think) but I haven’t made any money. So now, I’m going back to my notes from UIBC to see what I am missing. It’s kind of like cleaning out your closet. Amazing what I’m discovering that I haven’t done. But I digress. Taking action right away does make sense when you find something of value that can make a difference in your business. If it doesn’t work, put it back in your closet. But now, I know it’s in there in my closet. I had created a l;ot of other kinds of products (horses & beauty products) in the past, but this was my first info-product. We decided we would interview as many experts as possible over those three days. I ran after people and got 14 interviews. My friend ended up on day three with…. ZERO…. ZIP… 0… NADA. Those interviews became my first book, Click & Get Rich Online, audio and video program. It was scary to ask all the experts but they all said “yes” and I ended up launching the book with Alex Mandossian, so the massive action really paid off! Thanks Jeff, we appreciate you! really great discussion Jeff and Maritza (and btw you both rock! ), and I really love your “GUTS” tagline..but here’s a “kicker”..how are we supposed to be productive when we spend hours reading and commenting on each other’s posts and ruminations. Not a negative reflection on you or anyone but this whole social media thing…I know it can be a great way to build relationships but it can so easily become yet another time eater…where’s the tradeoff? How can we use social media in a purposeful, productive, efficient and strategic way…oh yeah, and profitable :). After attending a fabulous online revenue workshop end of January I’ve finally embraced social media and am now doing a lot more of it. I’m surprised that I’m enjoying it as much as I am–is it a phase? I am beginning to see the opportunities…and on the other hand, the potential for time wasting or activity that seems related to my busines yet doesn’t really build it. How many relationships can we really maintain? I want to know how the people that are being truly successful (adding value and making great money) are doing social media, creating and offering programs and products, running their businesses, AND having the time to have face to face relationships, eat, exercise, sleep (who does that anymore)…you know, have a life? Which I don’t define as staring at a computer screen day and night (anyone else with me on that?). AND while I was figuring that out, I wasted a lot of time. 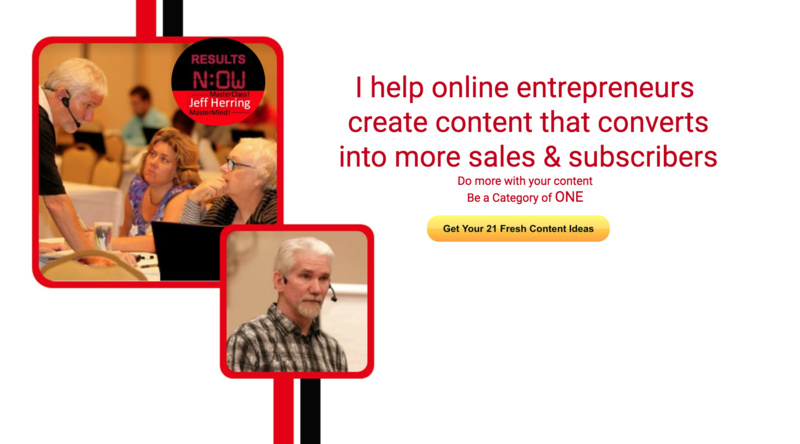 I run my business with something I call “controlled freedom” – kind of like “jumbo shrimp”. My days are scheduled very tightly and on my schedule I have social media time, reading & research time (which includes other blogs and commenting), content creation, copywriting, exercise, pre-posting content, etc and I use a timer. When the timer goes off, times up and I have to move on. There are sometimes emergency exceptions, but I think this is the only way to be able to handle these great tools we now have without letting them “handle us”. My method is a bit militant, but really who (or what) is in control? If you want a successful business, it MUST be you. Invest in a couple of loud timers, use them and let me know how it transforms your life! I guess you’re both right and there are some really good points made on this topic. The one thing the have learnt is that to change your outcomes or results you need to take action; now by productivity I assume that you mean efficiency and efficiency is very different from effectiveness, By being efficient or productive you could be working on the wrong thing whereas if your effective you’re working on the right thing and then you need to be efficient and productive. 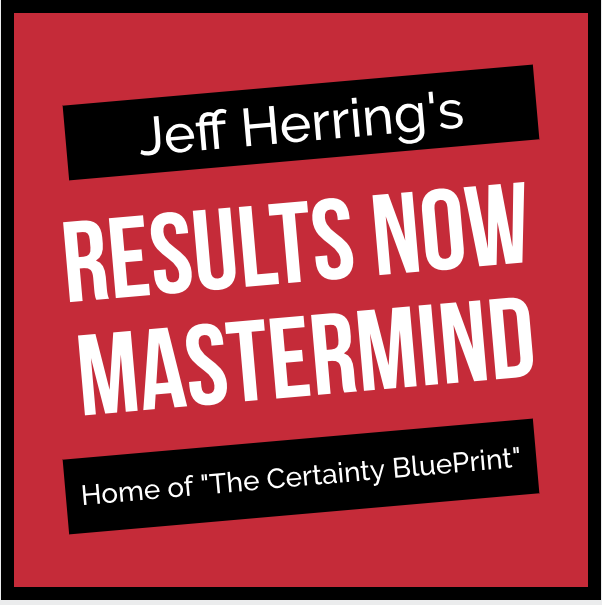 Now in my own case having learned a great deal from Jeff I have taken action, written and published articles, re purposed them on my blog and re tweeted them on twitter and the result is we have more traffic to the website. I’m now doing it more productive by speaking my articles. I’m leaning towards Maritiza on this one. As a recovering work-a-holic, one of biggest lessons in my life has been to let go and allow. Over and over I see examples of when I worked towards something and even when successful, did not bring the real joy of creating. That has come when I take action when in alignment. But even though working this way brings greater rewards, it has not and is not easy – taking forced action towards something each day comes much easier to someone like me. So I try to balance, actions I take each day to pay my bills and aligned action when I “feel” it towards a no money now but long term investment project. Can I do it faster? yes! Do I believe it will turn out as well forcing the work? no…. so I try very hard to work on this one project only when aligned and it’s amazing how much can be done so fast and I amaze even myself on the quality and creativeness. And guess what, money seems to come from other unexpected sources when I am working on this project – yet I still can’t let go of forced actions…….. it’s a journey. I have been writing articles for about a month now. I have seen a great increase in my backlinks and with some traffic too. Of course it is not what I thought it would be at the beginning, but I am determined to make at least some great goals and results. When the temptation to quit is the strongest, you are the closest to succeeding. Never give up. A very healthy discussion and most insightful from all who have joined this discussion. What I took from the post was more about what to do when you learn a new skill, or are exposed to a new strategy. The plan of taking action immediately to put in motion the new skill or strategy is, in my opinion, the only option. I will admit I am certainly guilty of not doing this at times but when I do I start the process of truly learning the intricacy of the strategy or skill. Only from this can I begin to assess the methods and results to determine if it is worthy of my continued efforts in honing the skill or strategy. Another huge benefit in doing it before your head hits the pillow is to at least get one attempt in and reinforce the mind with the procedure while it is fresh. If you get one attempt in on the day you learned the new strategy or skill then you are already analyzing the results tomorrow.